As the sport of fitness has continued to evolve, so have the arenas in which we, as fans of the sport, get to appreciate the incredible capacity, strength, and persistence of the best athletes. The top individual men and women get the most headlines, but frequently, the most impressive feats are reserved for some of the other divisions; specifically the Masters and the Teens. Despite the new format in place this season, all familiar age groups will continue to be present at the Games. However, this year in each division, only 10 athletes, rather than 20, will qualify. Wodapalooza is the first event of the season in which we get a chance to see some of these athletes compete; and you know they’ll be sizing each other up heading into the Open and the Age Group Online Qualifier. For both the men and women, there are five divisions of Masters athletes competing in Miami (35-39, 40-444, 45-49, 50-54, and 55+). On the Men’s side of things there are 18 past Games competitors across all divisions and for the women there are 15. The depth of experience here insures a great competition. Jeff Dempsey and Patrick McCarty (50-54) as well as Mike Kern (40-44) lead the way with three Games appearances each. Stuart Swanson (55+) and David Johnston (40-44) are the only athletes coming off top 5 Games finishes last year. Most competitors, across all these divisions will see this as an opportunity to assert themselves as top contenders for the year. There are five women competing in Miami who each have at least three years experience at the CrossFit Games as a Masters athlete: Colleen Fahey and Litsa Olsson (55+), Cynthia Truax and Trisha Beauperthuy (50-54), and Aida Koepplinger (40-44). Then there’s the 45-49 year old division which does not have a single athlete with Games experience in it. With a good blend of the old and the new, all divisions feature exciting competition. The teenagers have two divisions each (13-15 and 16-18). Nearly half of the teens (29 of 63) have previous experience at the CrossFit Games. 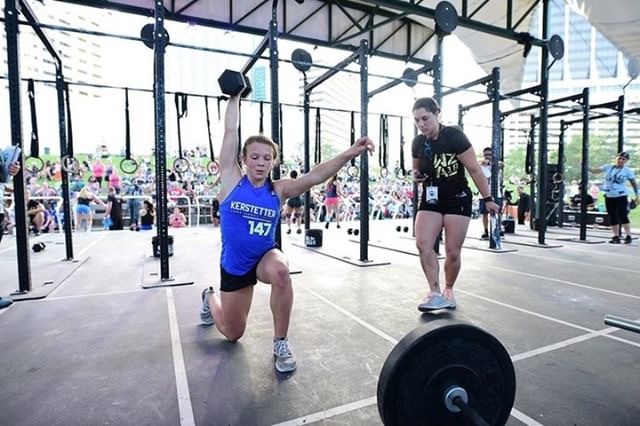 Among the girls competing, the top 6 girls form the 14-15 year old division at last years Games will be in Miami making for what is essentially a rematch and an opportunity to see if any of the others has caught up to defending champ Olivia Sulek, who trains out of ESF CrossFit in Ohio. In the older girls division many of the top athletes have aged out leaving the door open for athletes like Mikaela Senkus, Faith Ferguson, and Ellie Kerstetter who were 5th, 6th, and 7th respectively last year at the Games to assert themselves as the new top girl in the division. Lastly it’s notable that Ellie’s sister, Olivia Kerstetter, at 13 years old will be in the younger division. We’ve seen several pairs of brothers over the years in CrossFit, but it’s rare to see sisters at the top level. It will be fun to keep an eye on these two as they get older to see if they might become the first set of elite individual sisters in Games history. The boys side of things is opposite to the girls. In the younger division there are only two returning games athletes in Brynjar Ari Magnusson from Iceland, and Julian Rodriguez of Venezuela. The top qualifier, David Bradley from CrossFit 30004, will be looking to establish himself as the one to beat in this division early on this season. The 16-18 year old division features both of the CrossFit Games Teenage champions from last year. Defending his title, Dallin Pepper, now welcomes fellow champion Tudor Magda, (who won in the 14-15 year old category, but has aged up) to the division. Accompanying them are Dylan Klade and Noah Casey (3rd and 6th respectively at the Games last season), as well as William Kearney out of Gladstone Australia, where at only 18, he’s the head coach. Oh, and you might be familiar with Gladstone, Australia…that’s where Tia-Clair Toomey happens to be from. The Masters and Teenage divisions are always fun to watch. It’s incredible to see young kids, as well as the older generations, showing us that fitness is not bound by age. Whether you’re in Miami, or following along online, don’t ignore these divisions, some of the biggest athletic accomplishments and inspiration can be found here.